I love tags. It's a great way for me to use up scraps and other materials. I also love re-purposing things because there's SO much packaging and waste. So here's a project where the two come together. Faux Debossed Gift Tags from Suzer Space. 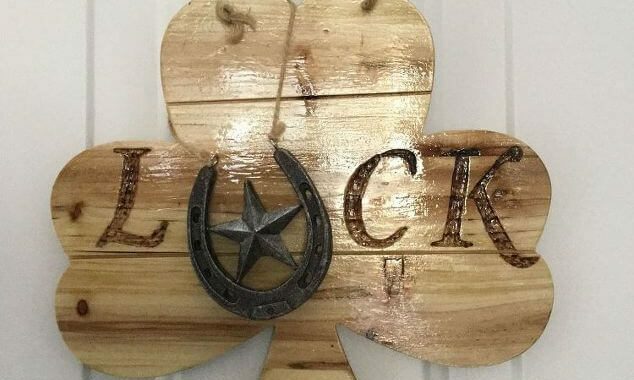 How pretty is this rustic horseshoe and succulent Wall Art from Fresh Vintage by Lisa S? You could put one up for St. Patrick's Day or just because. I'm really going to have to get one of the Dremel engravers like the one Chas from Chas's Crazy Creations used to make this votive holder. Possibilities are endless and love how this one turned out. Finally, here's a creative twist on Rice Krispies Treats: Rice Krispies Mountains from Mamas Brush. Friday eve greetings friends! Happy to say the snow from last week is all gone , the sun is back up in the sky and it's supposed to be in the high 70s in the desert once again like it should be. Whew! Hope you all have had a great week. I got to see my favorite Auntie whom I haven't seen in far too long. It's the end of February already! Yikes. Let's take a look at some of the great ideas from last week's party. As much as I love making cards, I also love getting them and when friends and family send me special ones, I tuck them away. Shoppe No. 5 has a great way to create art from them. Love this idea! 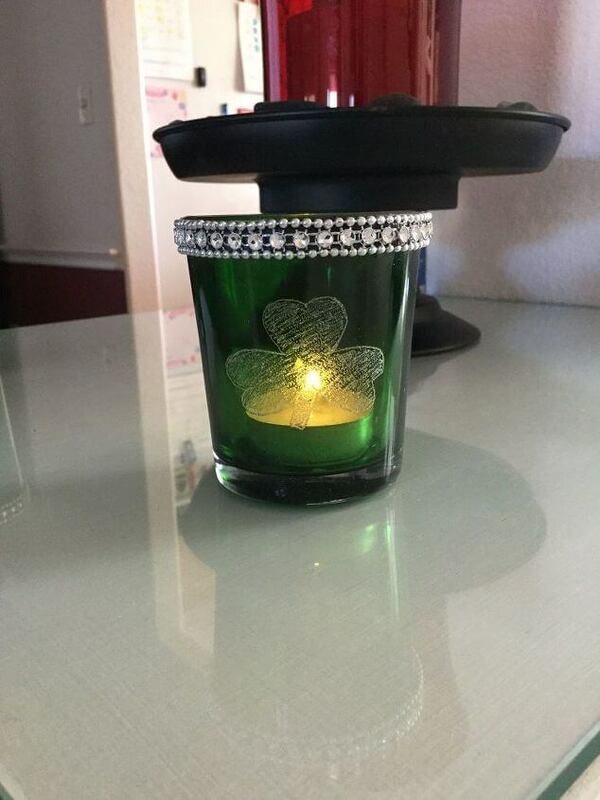 Want a really cool piece of St. Patrick's decor without spending a lot? 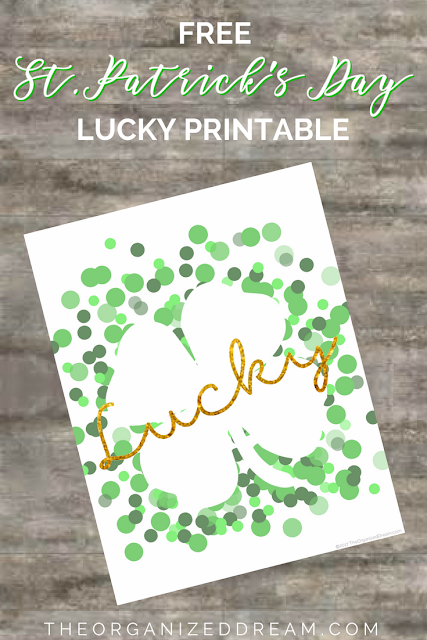 Check out this great Target find makeover Shamrock sign from Chas' Crazy Creations. Would you believe this heart is WOOD? I wasn't going to give it away but I'm so amazed at how it looks like a vintage rusty metal heart. 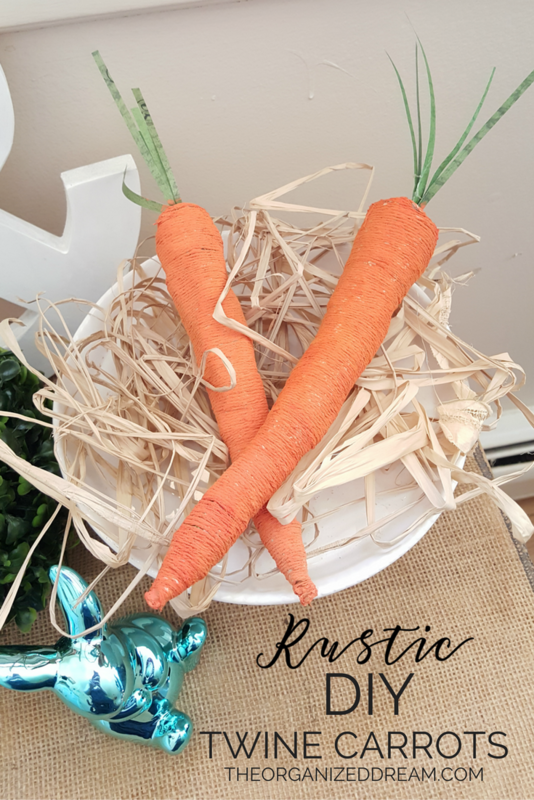 Check out the how to at Fresh Vintage by Lisa S.
Finally, with Spring and Easter right around the corner, these Rustic DIY Carrots from The Organized Dream are just the thing. Love them! Now let's see what everyone's been up to this week! Happy Love Day all ! We pass on all the hoopla and just enjoy that there's a day to tell those we love that we love them but whatever you're doing, I hope your day is filled with LOVE. Here are some ideas from last week's party that are perfect for V-Day, Spring, or any time of year! There can never be too much love nor can it be said too many times. So if you want to keep that reminder up all the time, this Wire Art from Lisa at Fresh Vintage by Lisa S is perfect!! 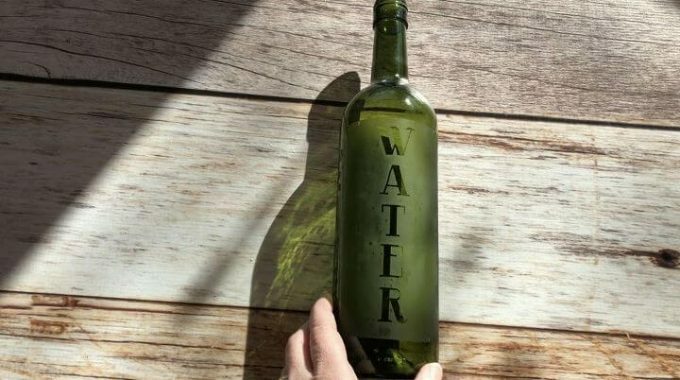 Never one to pass up a good upcycle, this re-purposed etched bottle from Chas' Crazy Creations is right up my alley. There's something about etched / frosted glass that attracts me every time! St. Patrick's Day is next month and while I don't do a lot of decorating, it's always nice to have a little touch here and there. 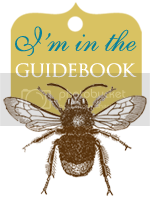 What better way than with a printable? The Organized Dream has you covered. 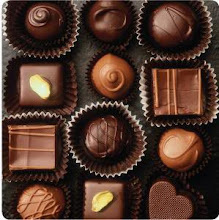 Finally, it wouldn't be Valentine's Day without chocolate right? These slow cooker fudge brownies from Looney For Food will do the trick! There's a very secret ingredient too! BFF Open House Link Party Back Up And Running! YAY! Happy Friday Eve all. I'm back up and running on my laptop with a new SSD hard drive and all my fonts and data files in tact. Whew! Thanks for hanging in there. Can I scare you? We're already almost done w/ January and Friday 1/25 marks exactly eleven months until Christmas. Can you believe it? I have vowed that I'm starting much earlier on handmade gifts this year because time flies. OK here are some features from last week's party. Thanks for hanging in and hanging with me! I love wood slices and have mostly seen them used as trays or plaques, but totally love this idea from Stephanis at Abbotts At Home to use one as a hanging rack! I have always had a thing for birch trees. 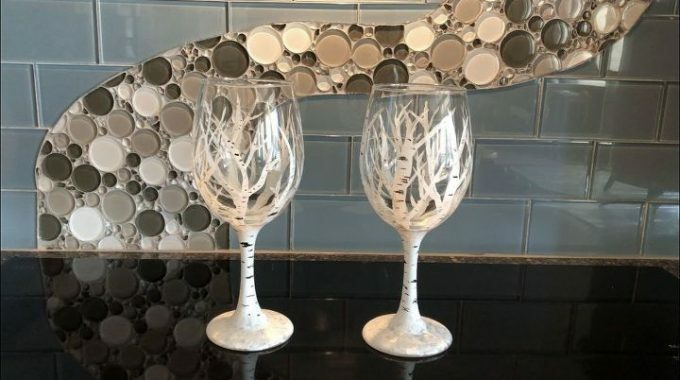 There is just something about them that is so appealing to me so I couldn't stop staring at these Hand Painted Birch Tree Wine Glasses from Chas's Crazy Creations. You could easily do on a plate, platter, vase. So Pretty! 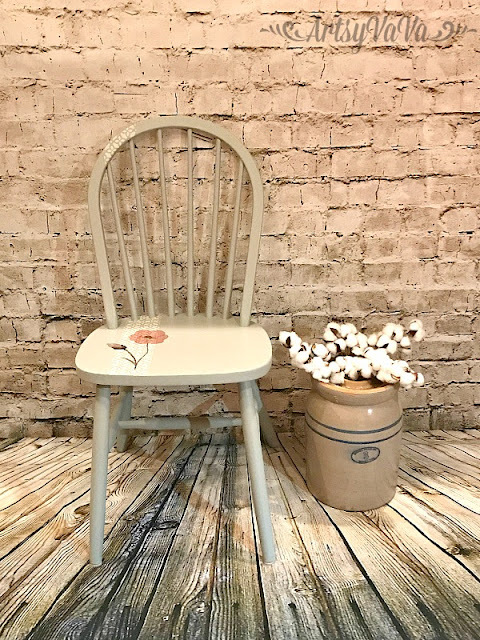 Also in love with this chair makeover from Virginia at Artsy VaVa. 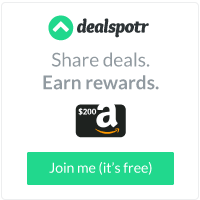 Wouldn't that be a special treat for your special Valentine? OK let's see what everyone's been up to this week! It's the most wonderful time.....of the week! Time to see what you've all been up to this week. Can you believe Thanksgiving is a week from today? Me either. So let's take a look at some project ideas it's not too late to whip up for next week. What's the best thing after finding a bargain find? Making it even better bu adding lights like Chas from Chas' Crazy Creations did with this canvas she found on sale for $5. Add battery operated lights and take it to a whole different level! If you're hosting, you could put this fab Gratitude Box from The CSI Project out for your guests ( or bring to your host/hostess as a great gift). 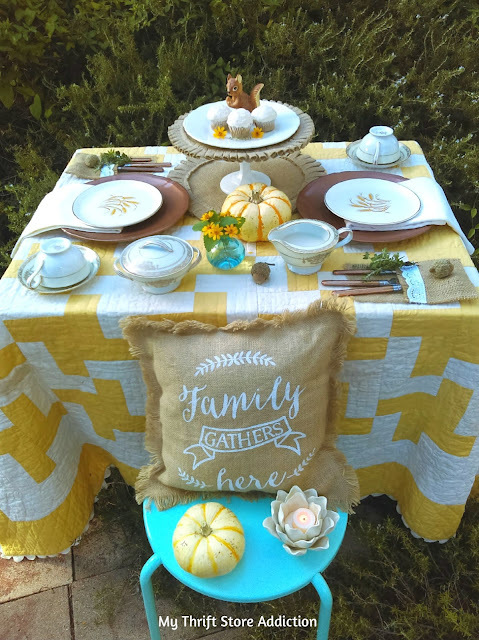 If you haven't decided on your Thanksgiving table decor yet, check out The Red Painted Cottage for some gorgeous ideas. I love the combination of naturals! Finally, I'm on a lifelong campaign to bring more chocolate to Thanksgiving. 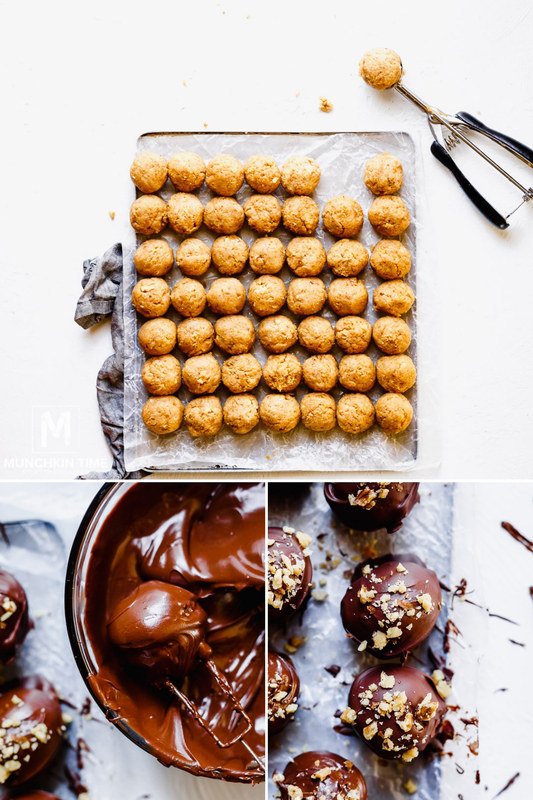 These Ultimate Pumpkin Cheesecake Balls from Munchkin Time do just that! Now let's see what you've all been up to this week! Happy Friday Eve all! Settling into desert life and still trying to process the reality that it hit 100 degrees in APRIL while other places in the country are still getting snow. Here are some features from last week's party! 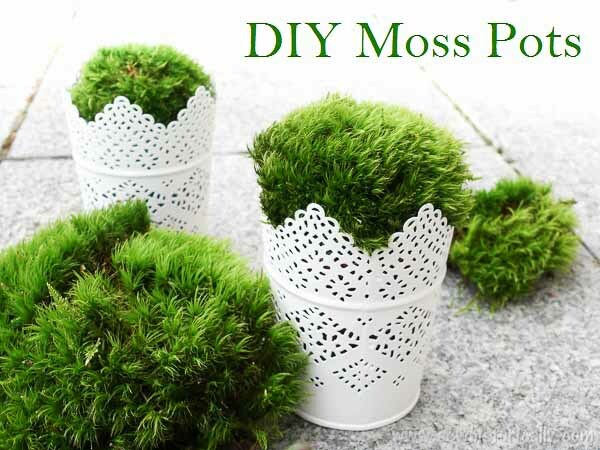 Let's start with these DIY Moss Pots from Sew Historically. I love how these add pops of nature and color to any decor. With outdoor entertaining season coming ( sooner for some of us) using the power of the Sun to light your outdoor decor is easy with this idea from Chas's Crazy Creations. She has a step by step tutorial and you just need a few items. As much as I love tech, and I do, there is still something about a written note. 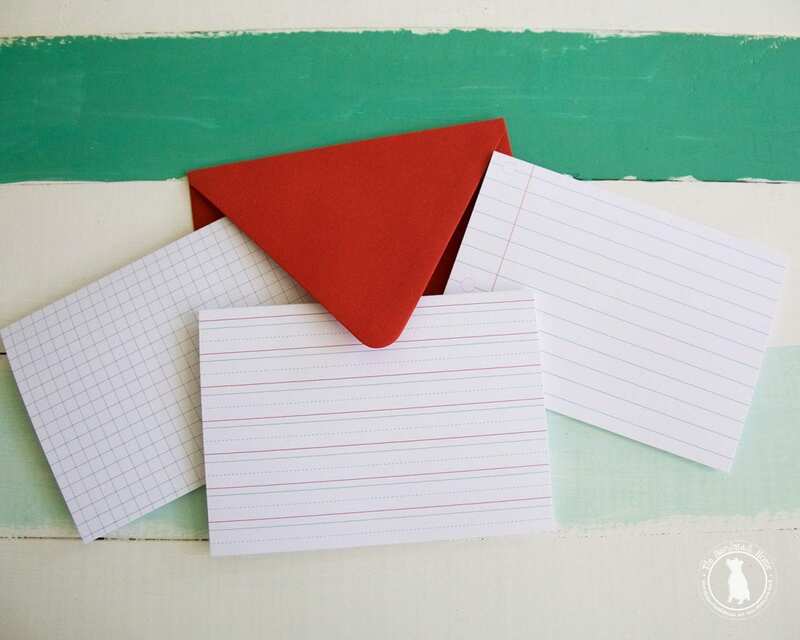 This free and downloadable stationery from The Handmade Home makes it fast and easy to do! You can print out a set for yourself or add to a girlfriend gift etc. Finally, you know this caught my eye! 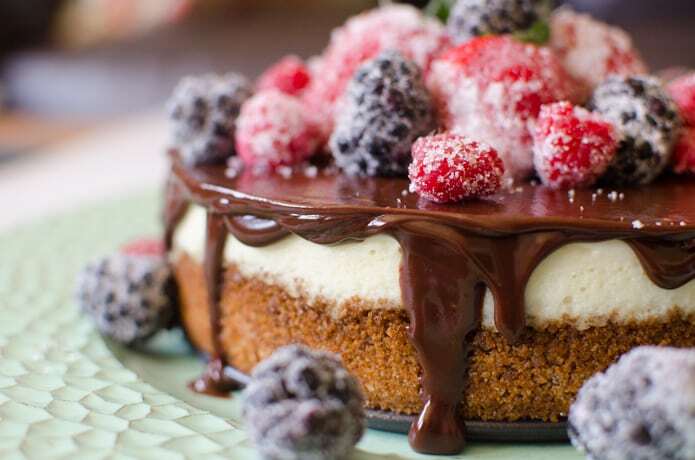 Chocolate Peanut Butter Cheesecake from Marilyn's Treats. Oh my! Now, let's see what you've all been up to this week! Not going to lie. Will be glad to say goodbye to October. Between being sick, having to start physical therapy and my mom having taken a fall, October can be gone! But on the upside,October has been filled with great Halloweeen and Fall projects shared by the awesome attendees who come to my little party and this has been THE bright spot in an otherwise icky month! Let's see some great ideas from last week! Pumpkins in decor carry us through November. 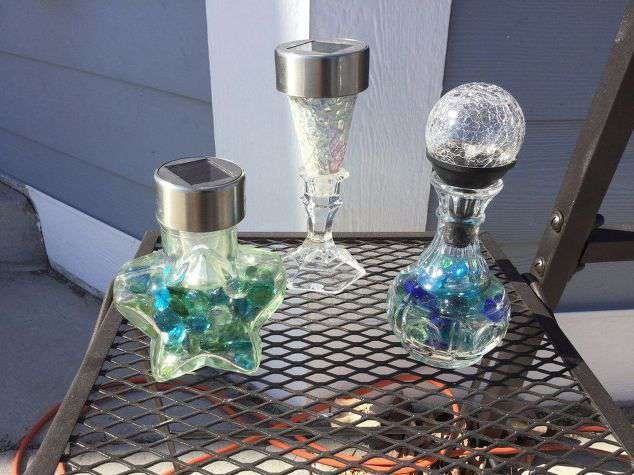 I adore these Glitter Glass pumpkins shared by Mary Jo from Masterpieces of My Life. She got a PB look w/ out a PB price! Another fun and inexpensive pumpkin idea is from Chas's Crazy Creations . 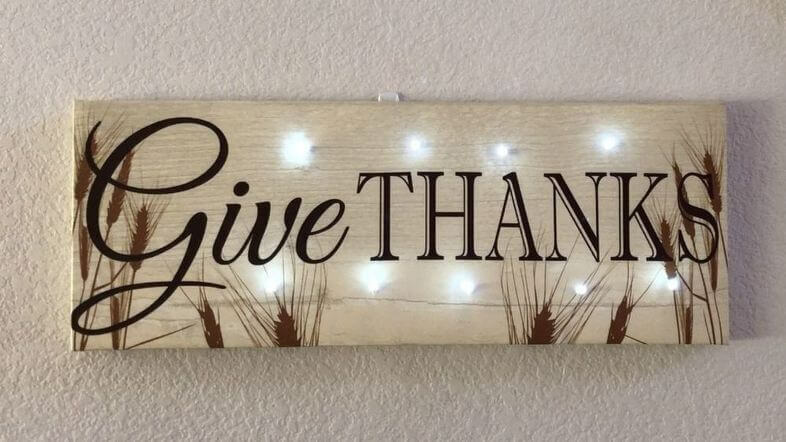 She used a Dollar Tree pumpkin and lights and I can see all kinds of possibilities that would be perfect for November projects! I have a love-hate relationship with pies. I love making them. I hate cutting them. I can rarely get a piece of pie out of the dish without destroying it. So these Mini Pumpkin Pies from From Play Dates to Parties are a perfect solution. Plus they make for easy transportation of leftovers! Before we leave Halloween though, here are a couple of chocolatey treats you still have time to make! Love these adorable Witches Brew Bites from Manic Mama of 3 ! from Sugar Spice and Family Life. I'm always looking for ways to bring chocolate to Thanksgiving. The colors of these are perfect! Now, let's see what you've been up to this week! Happy Friday and official start of Fall Eve all! I think we can all agree "Mother Nature, the world has had enough of you for a while". Thinking of the people in Mexico, Puerto Rico, the Caribbean who all got hit this week, along w/ FL , Houston and everyone recovering from recent weeks. Let's take our minds off things with some pretties OK? I love tiered things. Height always seems to bring depth. This DIY Modern Farmhouse Tiered Tray from Diane at An Extraordinary Day is so perfect! 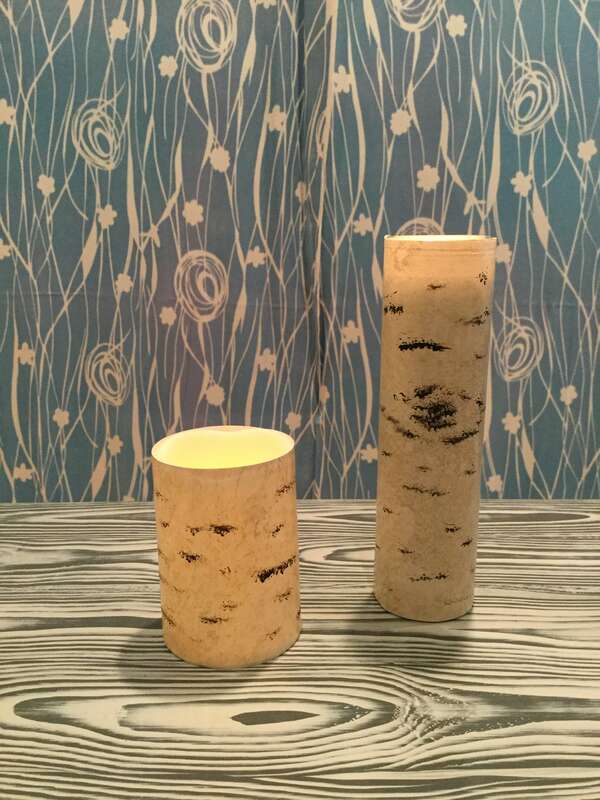 Would you guess that these birch candles are faux? Check out Chas' Crazy Creations to see how! Happy Friday Eve once again. Sadly once again it's a week where we're watching awful devastation from nature. To those in the path of Irma, Jose, still recovering from Harvey, dealing with fires in the West, be safe and smart! No material things ( not even craft supplies) are worth it! Let's take a break and see what everyone's been up to as we gear up for Fall. 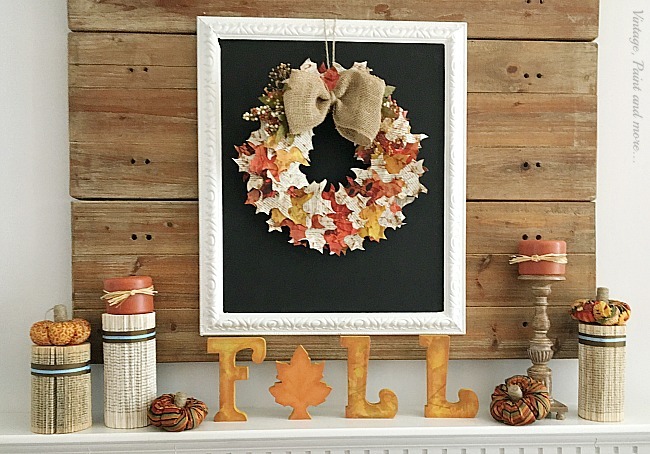 What better way to prepare for Fall than with a new wreath? Leslie from Playdates to Parties has got you covered with a roundup of ideas. If you're still enjoying some outdoor weather but transitioning to Fall, check out this idea from My Thrift Store Addiction. Coffee and cupcakes? Yes please! Fall is the start of candle season to me. Sure they are year round but those cooler and darker earlier months are perfect for a cozy glow from candlelight. 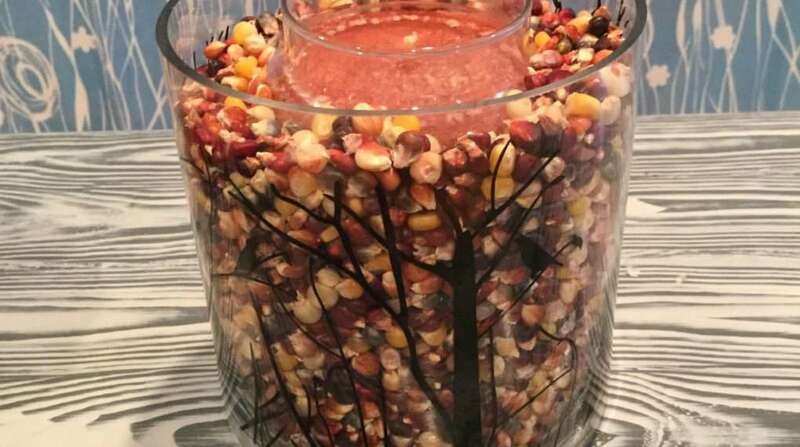 Chas' Crazy Creations has a wonderful way to display a Fall Candle. The secret's in the corn! And for this week's chocolate feature, what's better than a frosted chocolate cupcake? A frosted chocolate cupcake with a BROWNIE inside! From Sugar, Spice, and Family Life. Now on to this week's party! Thanks for being here.